The snow has moved in and is piling up quickly in many places. The storm took a while this morning to get going, but the snow started falling in earnest shortly after noon across much of the Philadelphia region. The lack of early snow accumulation had many doubting that a major winter storm was underway – if social media is any indication. But forecasters stuck to their predictions. The wet snow is coming down steadily across the city and its northern and western suburbs as the nor'easter – the second in five days – moves north up the coast. In eastern Montgomery County, a driveway is already covered again before it can be fully shoveled. Before it started again just after noon, the precipitation had varied from heavy snow in the early morning, to almost nothing, and then to a light wintry mix. But then the sky filled with snow again. 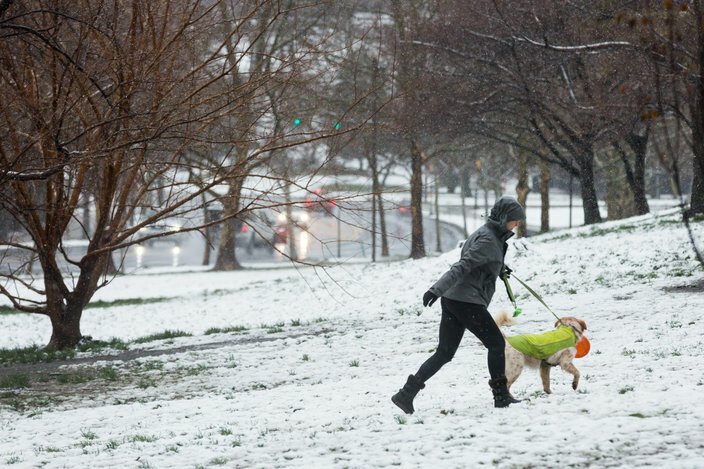 That the snow would eventually intensify after a slow start was predicted by the National Weather Service, whose forecasters on Wednesday morning hiked snow totals for pretty much the entire region, citing forecast models showing colder-than-expected temperatures. Most of the snow will fall before 7 p.m. 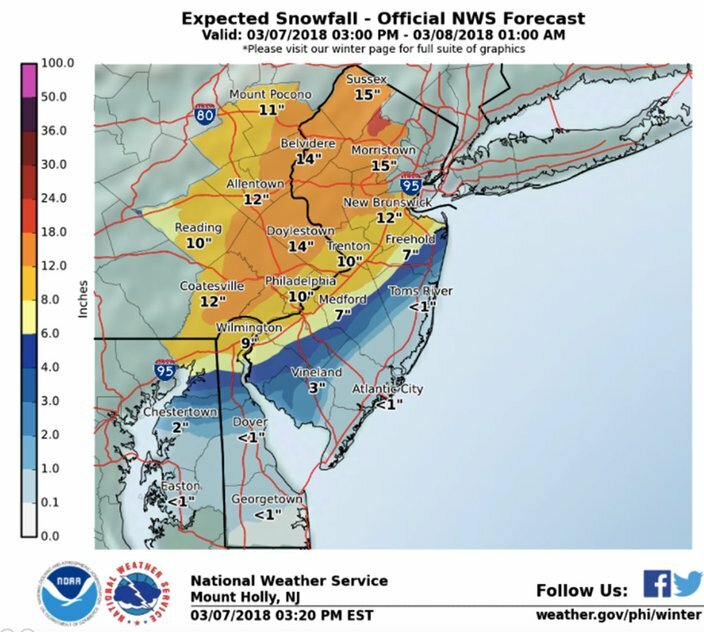 Forecasters have since scaled back snowfall estimates in South Jersey. Bands of very heavy snow with rates of around 2 inches per hour will move across the region through the afternoon. During lighter intensity late this morning, the snow will mix with rain in some areas closer to Interstate 95. Roads will quickly become snow-covered, resulting in very hazardous or impossible travel on all unplowed roads by late this afternoon. Visibility will be significantly reduced at times to a quarter mile or less and northerly winds will increase. This is when tree limbs may break or some trees are uprooted, especially where temperatures hover near 32 degrees. The result would be additional power outages. As snowfall rates reach or exceed 1 inch per hour, accumulation on roads will quickly become much more efficient and this will make it difficult for road crews to keep up. Travel is not recommended. Meanwhile, a winter storm warning remains in effect for southeastern Pennsylvania through 3 a.m. Thursday. An Upper Dublin snow plow is seen through a snowy path as it clears a cul-de-sac on Wednesday afternoon. In the city and its four suburban counties, 8-11 inches of snow is now expected, forecasters said. 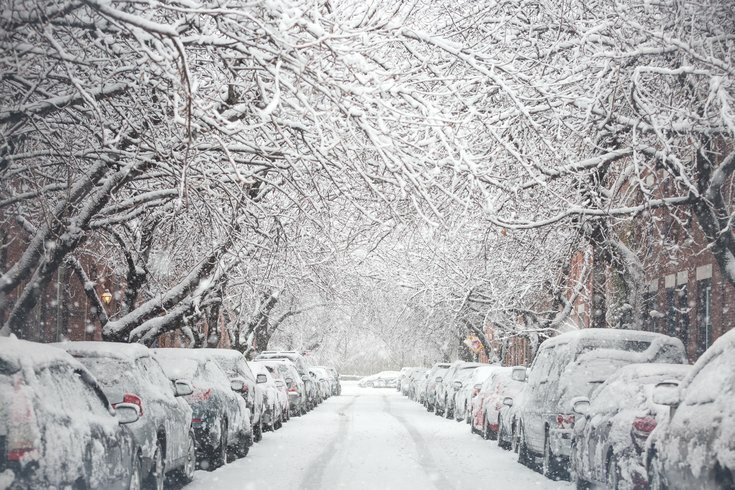 That amount of snow would shred the record for snowfall in Philadelphia on this date – 4 inches in 1969. From 10-16 inches are expected in the southern Poconos and the Lehigh Valley, as well as much of northern New Jersey. Snowfall rates of 1-2 inches per hour expected this afternoon. Heavy, wet snow is expected to impact travel by reducing visibility and causing slippery conditions. Forecasters urged motorists to exercise caution, especially during the Wednesday evening rush. The heavy snow may also help bring down trees onto power lines, roadways and property, causing power outages. In Philadelphia, trees toppled in the storm that pose a safety threat should be reported by calling 9-1-1. Otherwise, call 3-1-1. An on-call crew of arborists from Philadelphia Parks & Recreation will respond to tree emergencies and remove the hazard and any part of the tree that is an immediate risk to public safety. 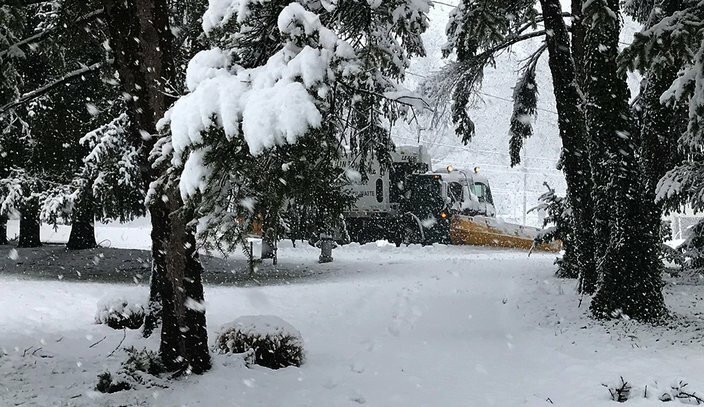 Parts of the region are still recovering from a nor'easter that struck Friday and Saturday with snow and strong winds, toppling thousands of trees and bringing down electrical lines. More than 14,000 PECO customers are without power as of early afternoon. Diana Harding and her dog Bailey walk through East Fairmount Park near Kelly Drive and Fairmount Avenue after playing frisbee on Wednesday morning, March 7, 2018. Wednesday: Snow, mainly before 5 p.m. High near 36. Northeast wind 13 to 17 mph becoming north in the afternoon. Chance of precipitation is 100 percent. Total daytime snow accumulation of 4 to 8 inches possible. Tonight: A chance of snow, mainly before 7 p.m. Cloudy, then gradually becoming partly cloudy, with a low around 31. Northwest wind 11 to 14 mph, with gusts as high as 25 mph. Chance of precipitation is 30 percent. New snow accumulation of less than one inch possible. Thursday night: Mostly cloudy, with a low around 29. West wind 9 to 13 mph. Friday: Partly sunny, with a high near 42. West wind 10 to 17 mph. The snowy scene in Bryn Mawr on the Main Line early Wednesday morning. Sunday night: A chance of rain before 1 a.m., then a chance of rain and snow. Mostly cloudy, with a low around 32. Chance of precipitation is 30 percent. Monday: A chance of rain and snow. Partly sunny, with a high near 45. Chance of precipitation is 30 percent. Monday night: A chance of rain and snow. Partly cloudy, with a low around 31. Chance of precipitation is 30 percent. Tuesday: Mostly sunny, with a high near 44.